I am very pleased and proud that my very own PhD student presented his thesis seminar last Wednesday to an enraptured audience (ok, maybe that was just me). Pat gave a talk on “Incorporating Acoustical Consistency in the Design for Manufacturing of Wooden Guitars”. The abstract of the talk is below as are also the photos. Click on the photos for a larger version! As a musical instrument construction material, wood is both musically and aesthetically pleasing. Easy to work and abundant, it has traditionally been the material of choice. Unfortunately, wood is also a very inconsistent material. Due to great environmental and climatic variations, wooden specimens present large variations in their mechanical properties, even within species of a similar region. Shockingly, an industry based entirely on acoustics, has done very little to account for these variations. For this reason, manufactured wooden guitars are acoustically inconsistent. Previous work has shown that varying the dimensions of a guitar soundboard brace is a good method for taking into account variations in the mechanical properties of the wooden soundboard plate. In this thesis, the effects of a scalloped shaped brace on the natural frequencies of a brace-plate system have been studied and tools have been developed in order to calculate the dimensions of the brace required to account for variations in the mechanical properties of the plate. It has been shown that scalloped braces can be used to modify two natural frequencies of a brace-plate system simultaneously. Furthermore, the most important criteria in modifying any given frequency of a brace-plate system is the mass and stiffness properties of the brace at the antinode of the given frequency’s associated modeshape. Subsequently, designing a brace for desired system natural frequencies, by taking into account the mechanical properties of the wooden plate, is an inverse eigenvalue problem. Since few methods exist for solving the inverse eigenvalue problem of general matrices, a new method based on the generalized Cayley-Hamilton theorem was proposed in the thesis. A further method, based on the determinant of the generalized eigenvalue problem was also presented. Both methods work well, although the determinant method is shown to be more efficient for partially described systems. Finally, experimental results were obtained for the natural frequencies of simply supported wooden plates, with and without a brace, as well as the inverse eigenvalue determinant method. Good correlation was found between theoretical and experimental results. The latest installment in our departmental seminar series (and I’m back to being seminar coordinator!). 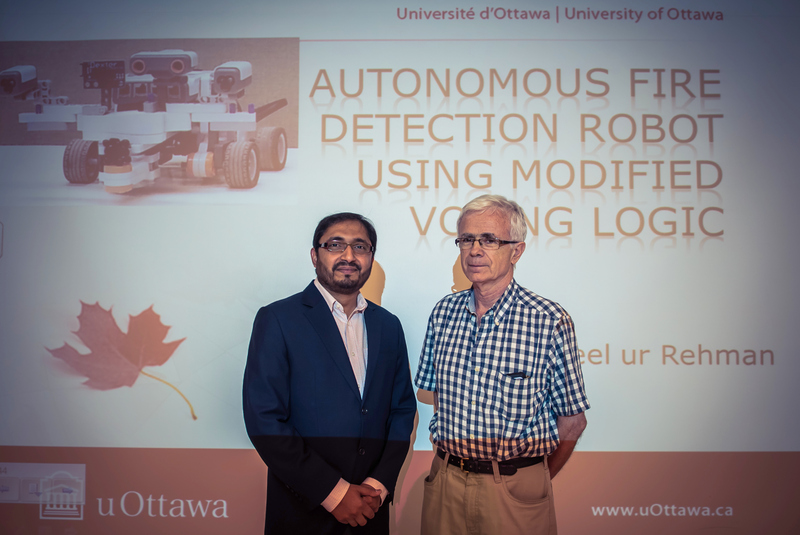 Adeel ur Rehman presented the subject of his MASc thesis “autonomous fire detection robot using modified voting logic”. Adeel did his research work under the supervision of Dr. Necsulescu. It was pretty cool to hear about fire-sniffing robots. Well, technically not sniffing since it Mr. Robot used heat and light sensors to detect fire.